All eyes are on the Federal Reserve Wednesday as the central bank is expected to take the first step in winding down the program of asset purchases it has deployed to support the economy and markets. U.S. stock futures edged higher, with investors cautious about taking any big bets ahead of the Fed's statement. Investors and traders have been bracing for the Federal Reserve to cut back -- or taper -- its stimulus measures, which have seen the Fed buy bonds and other securities worth $85 billion per month. Many experts are forecasting the Fed will make a small cut to its asset purchases this month as the economy has been improving and unemployment falling. Others expect the tapering to start later. The central bank is scheduled to release a statement at 2 p.m. ET following the conclusion of its latest policy-making meeting. Fed chair Ben Bernanke will then hold a press conference at 2:30 p.m. to discuss the Fed's latest assessment of the economy and its plans for the future. Related: The taper is coming. Get over it. "It's all about the Fed, not only the tapering decision, but also the statement language and the accompanying press conference," said Simon Smith, the London-based chief economist at FxPro. Ahead of the announcement, investors received one disappointing reading on the health of the economy. The Census Bureau's monthly reports on housing starts and building permits came in below expectations. FedEx (FDX) reported an increase in quarterly sales and net income, compared to a year-ago. Earnings topped forecasts. FedEx is often viewed as an economic bellwether given the nature of its business and its global footprint. Shares rose in premarket trading. Soccer club Manchester United (MANU) reported a jump in quarterly revenue, compared to the prior year, and a surge in net profit, compared to the year-earlier loss. Adobe Systems (ADBE) shares rose after the software maker reported strong subscription growth for its "Creative Cloud" service on Tuesday. Oracle (ORCL) will announce results after the closing bell. U.S. stocks finished higher Tuesday. The Dow Jones industrial average, the S&P 500 and the Nasdaq all ended the day with gains. The S&P closed within just five points of a record high. 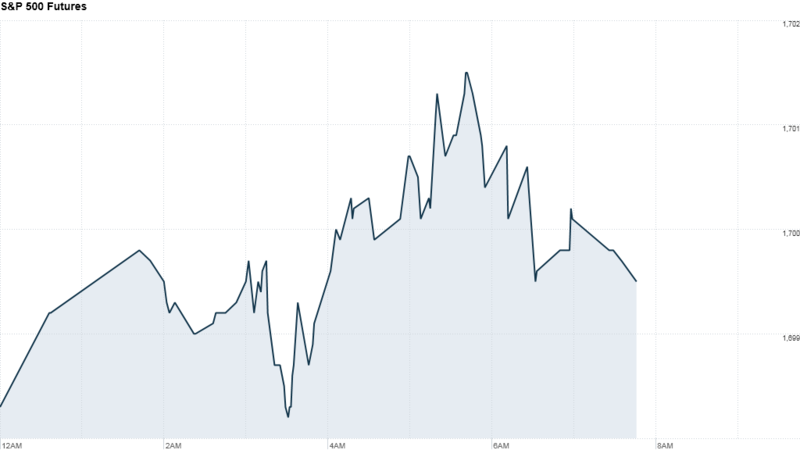 European markets were moving higher in midday trading. Asian markets ended with mixed numbers. Japan's Nikkei rallied by 1.4% but the main Chinese indexes were relatively unchanged.